Easy pop ice trays are manufactured from strong durable flexible plastic and releases 14 ice cubes per tray by a gentle twist or two. 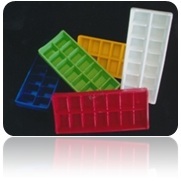 Four (4) ice trays per pack, assorted colours. More information on our ICE TRAYS Fundraising project upon request - please complete the form below.